The stems are short to elongate with a length between 15 and 30 cm. The simple leaves come in many shapes. Most leaves are to be found at the end of the stem. They may be erect or spreading in a rosette, with a length up to 40 cm. The leaves are petiolate. In drier environments, the leaves can take a bird's-nest-shape rosette that enables the plant to collect water. Terrestrials or epiphytes usually have cordate leaves. Some grow as vines with rosettes of lanceolate leaves. Some species have many-lobed leaves. The flowers are small (about 3 mm) and develop crowded in a spike with a fleshy axis and called a spadix, a characteristic of the arums. This spadix can take on many forms (club-shaped, tapered, spiraled, and globe-shaped) and colors (white, green, purple, red, pink, or a combination). Usually just below the flower spike lies a colorful, solitary spathe: a showy modified bract that can be somewhat leathery in texture. The spathe can vary in color from pale green to white, rose, orange or shiny red (such as A. andrenaum). The color changes between the bud stage and the anthesis, (the time the flower expands). Thus the color might change from pale green to reddish purple to reddish brown. The flowers are hermaphrodite, containing male and female flowers. The fruits are usually berries with one to multiple seeds on a pendent infructescence. The flowers of Anthurium give off a variety of fragrances, each attracting a variety of specific pollinators. 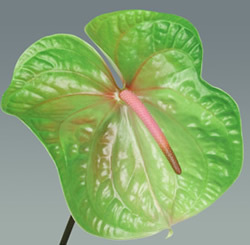 Anthurium is one of the important economic flowers of export potential. There are more than 500 species and several varieties. Few of them are commercially important. Anthurium andreanum, A. veitchii and A. scherzerianum are the economically viable species. Many of them are partially epiphytic in growth habit. Plants prefer to grow under shade. The tolerable level of light in the tropical region during summer is 20-30 per cent. Excess light causes yellowing and scorching of leaves. Very low light intensity causes excessive vegetative growth and low flowering. 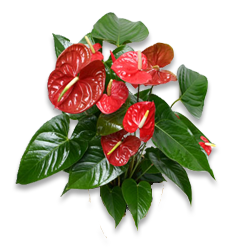 It is preferable to grow anthurium in the open, under artificial shade structures for better growth and yield. Plant prefers to grow under a relative humidity of not less than 60 per cent and a temperature of not more than 18-28ºC. The economic varieties suitable for Kerala condition are Lima White, Cuba, Agnihotri, Liver Red, Can Can, Tropical, Nitta, Sunburst, Linda-de-Mol, Tinora, Acropolis, Gino Orange and Midori. 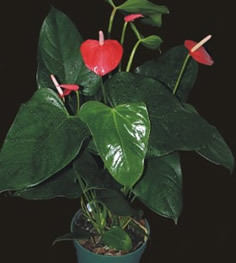 Anthurium is multiplied by seed and vegetatively by stem cuttings or by separation of basal sprouts. Propagation by seed is not recommended as a commercial propagation method as it results in high variability. Plants can be multiplied in large number by micro-propagation techniques from the tender leaf bits. Seeds are produced by hand pollination. Selfing or crossing can be made. Seeds become mature within a period of 4-6 months after pollination. Mature seeds will have a pulpy coating. The pulp is carefully removed without injuring the soft seed. Seeds are sown immediately after extraction. Sowing is done on a medium of clean fine sand or on a moist cotton pad. 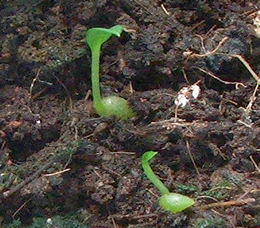 Sprouted seeds on cotton pad are shifted to a sand medium for further growth. Seedlings will take two years for flowering. Plants are propagated vegetatively by cutting the thick main stem into 3-4 cm long discs. If the stem is very thick, the discs can be cut vertically. 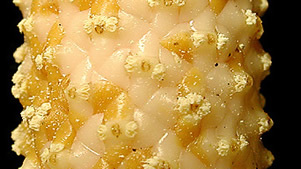 Each bit should have minimum two lateral buds. Cut-pieces are treated with a fungicide solution and planted on a medium of clean river sand. Cuttings will take 1-2 months for sprouting. Suckers from flowering plants can also be separated as and when available and planted in the medium. Seedlings and sprouted cuttings of 5-10 cm height are transferred to the main field or pots. Planting in pots is preferred in the plains. Cultivation in beds is good at higher altitudes (about 1000 m above MSL). 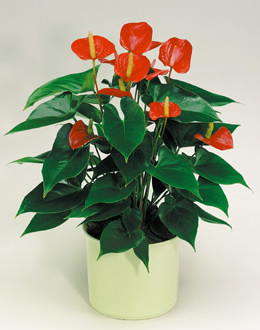 A loose medium above the ground is suitable for anthurium. Old and chopped coconut husk (3 cm size) mixed with brick pieces and charcoal are filled in narrow trenches 10 cm below and above ground level. Pots can also be filled with the same mixture. An ideal pot should be 30 cm diameter at top with 3 large holes at the bottom on sides. One seedling can be planted in a pot. On ground, the spacing is 45 to 60 cm depending up on the variety. Fresh cowdung or neem cake mixed with 10-15 times of water, kept for 4-5 days, can be sprayed on the plants after filtering. Cow's urine can be sprayed or drenched after mixing with 25 times of water. Complex fertilizer (N:P2O5: K2O 19:19:19) 2 g/l of water is applied in the medium once a week. Slow release fertilizers, if used, need be given only once in 2-3 months. Pruning of older leaves, removal of suckers at young stage, cleaning of crown before rains etc. are other operations to be carried out in order to have a better growth and flowering. The two major diseases are bacterial blight and anthracnose. Anthracnose is caused by the fungus Colletotrichum gloeosporioides. Symptoms start as tiny brownish spots on the flower spadix. During high humidity these spots enlarge, appear water-soaked and turn necrotic. Sometimes the entire spadix will turn black as lesions coalesce. The shape of most lesions is, however, angular due to the shape of the spadix tissue. As the disease becomes more severe, masses of orange coloured spores form on necrotic areas. Leaves and spathes are rarely if ever infected. Bacterial blight disease is caused by Xanthomonas campestris pv. dieffenbachiae. 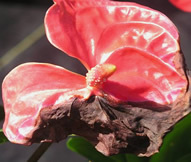 In the humid tropics, high rainfall coupled with year-round high temperatures increases the severity and spread of bacterial blight disease making it a very important impediment to the cultivation of anthurium. Blackening of the stem and decay of leaf axils are the symptoms of bacterial blight. Spraying mancozeb 0.3% or carbendazim 0.05% can control the disease. Root rot caused by Pythium and Phytophthora can be controlled by the application of potassium phosphonate 0.3%. The most effective control measure for bacterial blight disease is the use of resistant cultivars. The use of such cultivars will reduce the cost and risk associated with anthurium cultivation. The major pests are scales and bugs, which are controlled by spraying malathion @ 2 ml per litre of water. Snails also cause damage to young roots. Slugs and snails are of quarantine significance on exported plant material. Control must be 100% for quarantine security. Sanitation is vital to slug control. Slugs escape hot, dry conditions by hiding between the soil surface and any material on the soil during the daytime. Removing boards, pots, and any debris from growing areas will reduce slug cover for slug and snail breeding areas. 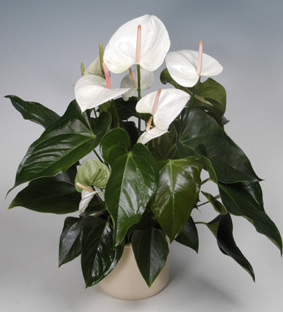 Pruning anthurium plants will allow sunlight to reach the soil. Weather conditions affect slug and snail populations. Hot dry weather or excessive flooding can reduce the populations; while cool, damp weather encourages population growth. Baits are the preferred method of control. Baits consist of a base that is attractive to slugs plus a poison. Use of metaldehyde can prevent the attack of snails. The flowers are harvested with its long stem when 1/4th to 3/4th flowers on the spadix are open, indicated by the change of colour. Colour change varies with the varieties. Although the industry has no major packaging problem, it is very much concerned with the shelf-life and the quality of flowers upon arrival at the markets. Factors such as the mode of transportation, conditions during transport and while in storage at the distributors, time lag from shipment to ultimate sale ("Chain-of-Life") are very important in the maintenance of quality and extending shelf-life. The industry believes that most of the abuse suffered by the flowers occur after the flowers leave the packing shed and before they arrive in the markets. Flowers sometimes freeze in transit during the winter. During the summer, flowers are damaged while they are stored in containers left in the open at airports where the temperature within the containers could reach 49oC or higher. The quality of the water in which flowers are held after harvest also affects the quality of the flowers. The industry would like to see if proper nutrition and other cultural practices could pre-condition flowers to withstand post-harvest handling and transportation abuses better. Reduced post-harvest life is apparently associated with clogging of the vascular tissue in the stem by a flower-produced material. Silver nitrate (together with distilled water) treatment of the stem reduces this blockage and helps maintain water conducting tissue, thereby increasing post-harvest life by up to 50%. Initial results indicate that surface shipping of anthuriums and accumulation of flowers for peak demand with air shipment is feasible using dry packing procedures and silver nitrate treatment. Reduced water loss from the flower by wax coating also increases post-harvest life up to 30%. The best wax of those tested was a carnauba base wax (FMC-819). Both of these treatments (silver nitrate and wax) have commercial possibilities with the wax treatment being the easiest to use. Some growers who have used the wax treatment say that the added sheen is very attractive. In tests conducted on the farm, it was found that calcium nitrate treatment in combination with waxing at 80% relative humidity (RH) significantly increased shelf-life of miniature anthuriums. In experiments on refrigerated storage, it was found that there is no significant difference in the vase-life of flowers when stored at 13oC and at room temperature for 7 days. The major limitation to post-harvest life is apparently the clogging of the water-conducting tissue of the stem. Until this problem is completely overcome, other treatments may not significantly improve total post-harvest life.